Growing up in Germany, Nils G. Walter formed a positive, but secondhand, impression of the United States. His father had been a prisoner of war in Texas who often told Walter about the kindness of Americans and T-bone steaks the size of dinner plates. “There were a lot of positive feelings in my family, and in Germany in general, about America,” said Walter, the Francis S. Collins Collegiate Professor of Chemistry, Biophysics and Biological Chemistry. Still, it was Walter’s love of chemistry that ultimately led him to move to the United States. After he received his Bachelor of Science and Master of Science degrees from the Technical University of Darmstadt in Germany, he flew around the United States, where he was enthralled by American landscape and culture. After receiving his Ph.D. in Germany at one of the venerated Max-Planck-Institutes, he decided to complete his postdoctoral fellowship at the University of Vermont. Walter’s original plan was to return to Germany after his postdoctoral work. However, his affinity for the United States, and the country’s support for young academics by granting tenure-track positions made him decide to apply mostly to American universities. Walter was hired for a professorship at U-M in 1999, and has been rising through the ranks since. He is a professor of chemistry and biophysics in LSA, and professor of biological chemistry in the Medical School, and the founding director of the Single Molecule Analysis in Real-Time Center, a university-funded, open-access facility that allows researchers, inside or outside of the university, to use tools that allow them to see single, microscopic molecules, one at a time. Walter first learned about RNA molecules when enzymes built from RNA were a new concept. Years later, while attending a symposium in Switzerland, Walter met Tom Cech — one of two chemists awarded the 1989 Nobel Prize in chemistry for discovering catalytic properties of RNA, suggesting that RNA could have sparked life on earth. This notion is the center of Walter’s work today. 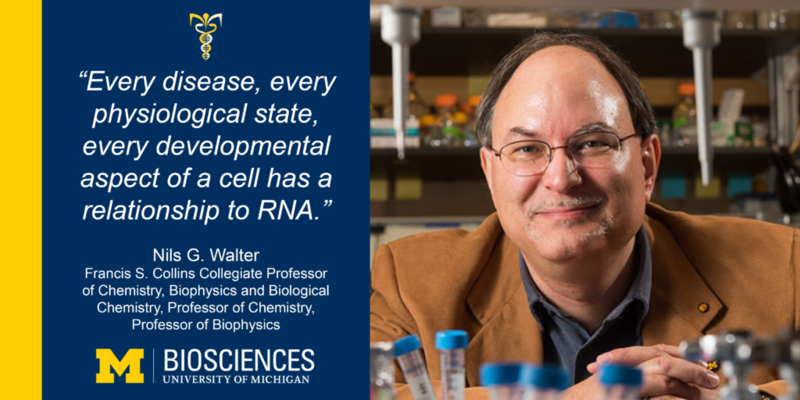 At U-M, he recently became a founding co-director at the Center for RNA Biomedicine, which is a grassroots assembly of more than 150 faculty members. The center aims to interrogate the functions of RNA and to uncover the potential implications of RNA for medical science in a collaborative way. To both inform his organizational work at the center and to prepare for submitting a funding proposal to U-M’s Biosciences Initiative, Walter spent six weeks at the Chan Zuckerberg Biohub in San Francisco. The Biohub aims to unite pillars of excellence across disciplines to cure all diseases within the next 100 years. The Center for RNA Biomedicine’s proposal recently was chosen by the Biosciences Initiative for tier-one funding. With this funding, the center will hire five people to evaluate RNA functions in diseases and help all center faculty discover ways to combat these diseases with drugs, or to use RNA molecules themselves as therapeutic drugs.